Haven't You Heard? I'm Sakamoto (坂本ですが? Sakamoto desu ga? ?, lit. "I'm Sakamoto, You Know?") is a Japanese manga series written and illustrated by Nami Sano. The manga follows a high school student named Sakamoto, who has a reputation for being the "coolest" person among the entire student body. 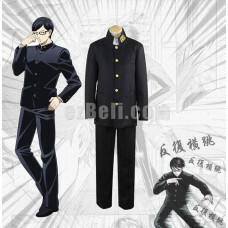 Includes: Jacket, Pants Material: Uniform Fabric Guideline on Body measurements Import..